Following the small mintage of 1796, U.S. quarter production came to a halt. Since the role of a twenty-five cent coin was being filled by the Spanish Two Reales (better known as “two-bits”), the Mint opted to direct their scarce resources elsewhere. What’s more, bullion owners preferred the more convenient silver dollar in exchange for their deposit. Quarter production resumed in 1804. The obverse featured the same Draped Bust Liberty from 1796, but the reverse now displayed a large, sometimes called “Heraldic”, eagle. The small eagle was perceived to convey weakness, so the Mint switched to a more robust bird. The 1804 Draped Bust Large Eagle Quarter is by far the rarest of the Heraldic Eagle type. Only 6,738 pieces were coined, and of that number, only a small fraction survives today. This great rarity always generates excitement amongst the collector class when offered for sale. The 1804 Draped Bust Quarter with Large Eagle is off the charts! The blue line above graphs the percent change in value of the 1804 quarter since year 2000. 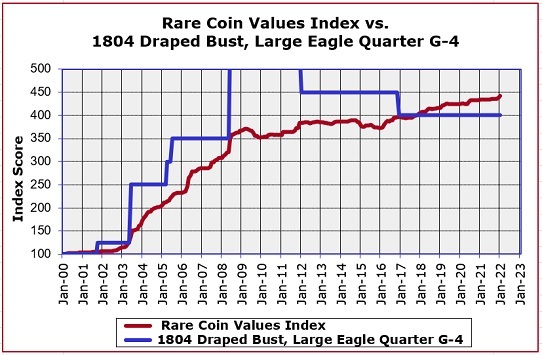 The red line tracks the performance over the same time period of the Rare Coin Values Index, which is the composite percent change of a cross sectional group of 87 rare US coins. The goal of the Index is to provide understanding of the strength and direction of the overall rare US coin market. The 1804 Draped Bust Quarter is one of the 87 coins in the Index. The Index is updated monthly.